Cushion Cover Size W x D: 14" x 16" 16" x 16" 16" x 18" 17" x 16" 17" x 18" 18" x 16" 18" x 18" 20" x 18"
The Replacement Cover for ROHO HARMONY® Cushions features two-way stretch top enables the cushion cells to conform to the individual's body shape without diminishing product effectiveness or therapeutic value. Top material is made of 100% Polyester. Side material is composed of a 3-layered knit polyester spacer fabric, which provides superior air circulation that ventilates and cools the user. Fluid proof, solid, non-skid base material offers a durable easy to clean surface. Velcro straps placed on the bottom allow the individual to attach the cushion to their chair. 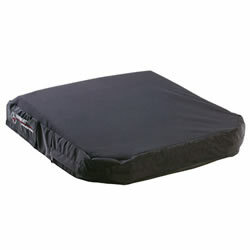 Encased foam is stitched to the cover for added comfort around the leg trough areas. Moisture-resistant cover is machine-washable. 6 Month Limited Warranty. Complies with EN1021-1 and EN1021-2 flammability requirements. The top and sides material is now 100% Fire Retardant Polyester.